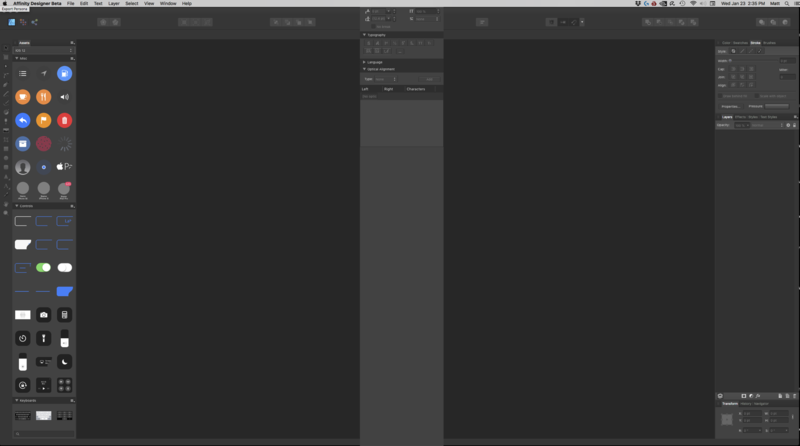 When I try to open a new studio (panel), the panel opens in the center of my screen and so tall that I can't see the top of it. I can't grab it to reposition it anywhere. I've only tried this with Character and Isometric panels, they both do the same thing. I've found that useful from time to time in similar situations. Are you using the 1.7.0.4 build at all? This was a known issue that got fixed in 1.7.0.4. Could you first go to ~\Library\Application Support\ and zip up the 'Affinity Designer Beta' folder. If you could then attach that it would be very useful. Finally can you then try View > Studio > Reset Studio and see if that corrects them when opening them please?